Have you always been an organized person? Are you physically fit, reliable and on time? Are you outgoing and enjoy working with other people? Do your friends and family think you have a good decorating sense? Are you careful and meticulous? Do you have a positive, friendly outlook? Are you honest, loyal and discreet, and free of any criminal background? If so, you may be a perfect Clutterbusters!! team member! You will learn the organizational techniques we’ve developed and the various products and services we provide, and then it’s time for more advanced on-site training. Most importantly, you will have fun meeting new people and developing a skill that can provide you with unlimited lifetime earning potential. Already a professional organizer? We have opportunities for you as well! Professional organizers with an existing organizing business who wish to work on Clutterbusters!! projects, or those desiring to learn about how they can incorporate themselves and work for Clutterbusters!! on a non-exclusive independent contractor basis. All independent contractors are solely responsible for complying with federal, state and local laws and regulations governing their independent contractor status. 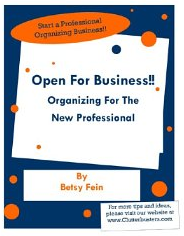 Check out Betsy’s eBook on how to start your own Organizing Business!! “With my guide, you can transform your life into one of freedom and independence as a Professional Organizer in your community. Plus, you’ll have the satisfaction of helping people de-clutter their home and offices and regain control of their lives. Believe me, it’s a rewarding experience. I love every minute of professional organizing! Open For Business!! 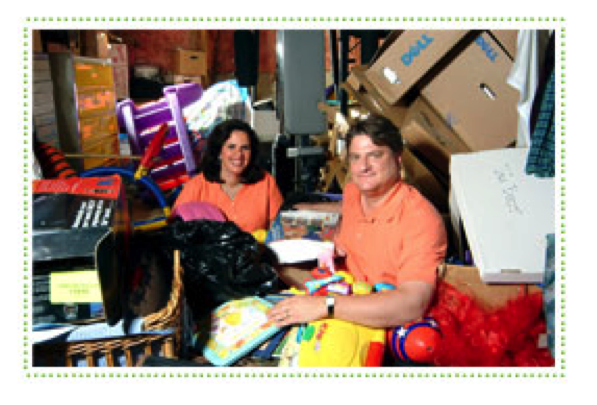 Organizing For The New Professional provides you with a complete and fundamental course in the art and science of organizing homes, basements, closets, home offices, corporate environments, and any other cluttered space that’s badly in need of organization. More importantly, I show you how to make good money at it so you can have the independence you’ve desired all these years. I promise you, there’s no fluff and no gimmicky “get rich quick” advice. I’m a firm believer in the satisfaction that comes from hard work and dedication. I know you feel the same way. You have pride in yourself and your efforts, and because of that, you deserve to share in the rewards of a rich career, just as I have done. Or select a Coaching/Consulting Package below! Guidance and tools you need to launch your organizing business! Guidance you need to take your organizing business to the next level!